Advances in technology such as robotics, Big Data, 3D printing, AI, virtual reality (VR) and augmented reality (AR) are driving big changes in many industries. If you want to stay competitive, you need to keep up. For example, real estate and hospitality businesses can gain an advantage by showing prospects up close and immersive presentations with 360-degree videos. 3D printing is poised to disrupt many markets, allowing consumers to print out products at home. If you aren’t prepared for this you may suffer the fate of video stores who went out of business when online streaming started to take off. It’s always a good idea to stay current with the latest technologies so you can take advantage of them rather than becoming a casualty. There are always new platforms, ways to advertise, and other marketing trends that come along to change how people shop. This is another area where it’s important to stay informed so you don’t fall behind. For example, personalization is a major marketing trend. This includes email and social media segmentation, where you target specific customers based on their interests and buying behavior. You also need to keep up with the latest social media features. For example, in the last couple of years Stories, first on Snapchat then on Instagram and Facebook became a huge feature. Businesses can now advertise on Stories. Live streaming video on platforms such as Facebook Live, YouTube Live and Periscope is another example of a popular feature that can be leveraged for marketing. Another of the biggest 2019 business trends to watch is the increasing focus on privacy. With regulations such as GDPR in effect, businesses must be extremely transparent about how they collect and use data. Even if you’re within the law, it’s important that your customers feel confident that they can trust you not to violate their privacy or use their data in a way in which they haven’t consented. Entrepreneurs are, by nature, optimistic and eager to believe that they determine their own destiny. While this is a useful and empowering belief, you can’t deny that you are also affected by world events. When contemplating 2019 business trends, you can’t overlook the influence of unpredictable political and economic outcomes. Stay as informed as you can about developing trends so you can make proper adjustments as needed. The best way to prepare for the unpredictable is to do everything you can to make your business stronger and prepared for unfavorable conditions. Keeping your costs down, providing the best possible customer service and taking steps to improve your cash flow are all ways to help you thrive regardless of external conditions. 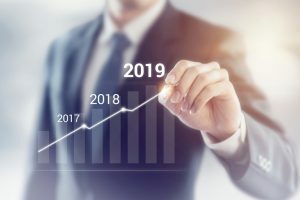 Business success in 2019 will depend on many factors, including the three types of trends we’ve discussed here. Running a business today requires you to pay close attention to all of the latest news in areas such as marketing, technology and the wider economy. If you want to be fully prepared for whatever the coming year will bring, it’s important to maintain a healthy cash flow for your business. This lets you invest in new technologies as well as cushion you from any unforeseen slowdowns due to the economy. One of the best ways to improve cash flow is to utilize invoice factoring. Riviera Finance, an industry leader for small business financing, can help you obtain immediate cash for your invoices. To learn how invoice factoring can help your business grow faster in 2019, contact Riviera Finance.